Last winter, when work began on the RV-12 checklists posted a few weeks back, I had placed the checklists on laminated cards which were used in conjunction with a kneepad. When the commitment was made to adapt the checklists for use with the Dynon SkyView, I knew the checklists on the laminated cards seemingly had a nice flow and covered the essentials … so the cards were basically used as the template for the SkyView checklists. I’m sure RV-12 pilots have noticed that the checklists are, by in large, directly from Van’s RV-12 Pilot’s Operating Handbook and adapted to fit the SkyView’s 31 character display limit for a 40% display … of course, additional steps were added to accommodate the DOG Aviation RV-12’s parking brake and fuel pump switch, plus a few extra items that seem worthwhile including. It is interesting how something that should be so obvious isn’t. Now that I’ve had a few flights actually using the SkyView to display the checklists, some minor changes have been made to improve the checklists based on actual in aircraft use and not computer screen time with a text editor. I just had to laugh at myself the other day when I realized what reads good on paper doesn’t necessarily make sense in the cockpit when using the SkyView to display the checklist. As an example … the card version of the Before Start checklist began with checking baggage area, seatbelts, passenger briefing, verifying panel switches are off, adjusting air vents, ect. …. then turning on the Master Switch …. DUH!!!! How could one be reading the SkyView checklist in the first place if the Master Switch is off??? LOL (If using a paper checklist … I would still list all that stuff first). So after a moment of sobering clarity, the checklists have been edited and tweaked a bit based on actual use in the RV-12. As such, I have omitted some items and added items based on the way the SkyView boots up. For example, one of the earlier checklists contained a step to check the expiration date of the navigation database. This step is not needed and was DELETED because shortly after initial boot-up, IF the navigation database is expired, the SkyView displays a dialogue box stating that the database is expired … so the pilot WILL know the database is expired as can be seen in the screenshot below. A screenshot taken from the SkyView manual showing the expired database dialogue box. The pilot WILL see this screen shortly after the SkyView initializes after power up if the installed aviation database is expired … so there is no need to manually check the expiration date as a standard checklist item. The Fuel Computer is another window that may pop up shortly after the SkyView boots up if the fuel level sensor differs from the fuel computer … as after refueling the aircraft. Shown in the screenshot below there are a few different ways the Fuel Computer can be adjusted … so a mistake could be made if not careful. The pilot can either push a Match button to match the readings, push a Full button to tell the Fuel Computer the tank is full or push an Accept button to accept the current Fuel Computer value after turning a knob to make a manual adjustment to the fuel quantity. As such, a checklist entry was ADDED to bring up the Fuel Computer as a second check to confirm the Current Fuel Computer Quantity is actually set to the value the pilot has verified to be the correct amount of fuel onboard. [As a side note, another reason I added the previously mentioned step is because of the physical placement of the fuel level sending unit in the fuel tank and the shape of the RV-12’s fuel tank … because of the placement and tank shape the fuel level sending unit will not reflect accurate full tank readings. This is because the fuel sending unit’s float arm hits its full position limit at approximately 16 gallons of fuel … this means the additional 4 gallons of fuel the tank can hold will not register on the digital fuel gauge displayed on the EMS (engine management system) screen. Fortunately, there is the Moeller mechanical fuel gauge on the top of the fuel tank which will show fuel levels in excess of 16 gallons even though the displayed fuel level on the EMS page will only display 16 + gallons until the fuel in the tank gets below that amount. 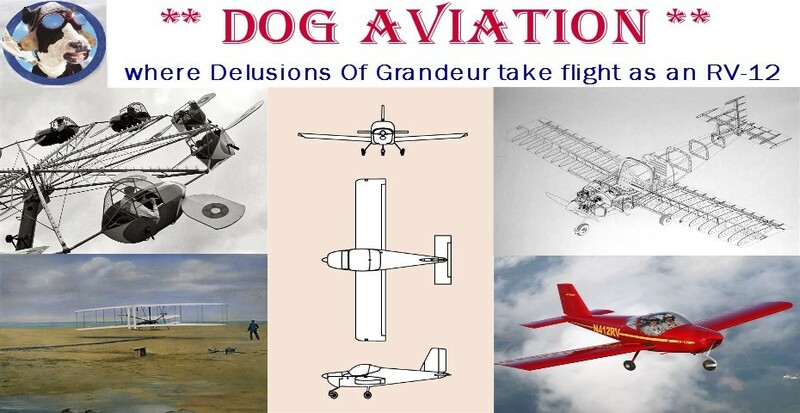 Sure the float arm in the tank could be adjusted to read higher tank fuel levels … but the accuracy of fuel level readings at lower levels would suffer greatly … and frankly, that is where a pilot needs the most accuracy]. 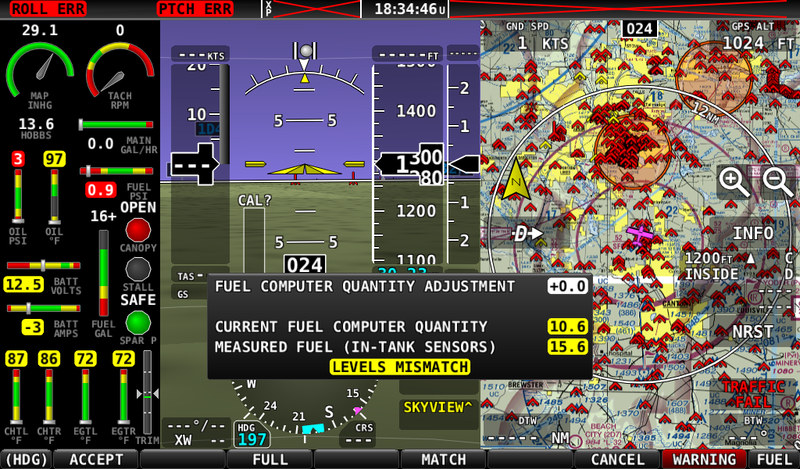 Screenshot of the Fuel Computer window that will pop up shortly after the Skyview is powered on if the Skyview senses a fuel level mismatch. In this case, fuel was added to the tank just prior to powering up the SkyView. 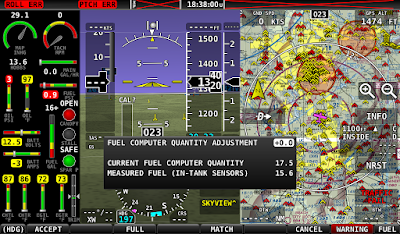 Note the buttons available for Accept, Full and Match … plus the availability to manually adjust the fuel computer quantity using a knob below where it says Fuel on the bottom right of this SkyView screenshot. After this screenshot was taken, I adjusted the Fuel Computer Quantity to 17.5 gallons to reflect the actual amount of fuel in the tank … this can be seen in one of the screenshots posted below. Checklist revisions: In addition to omitting checking the expiration date of the navigation database and adding the Fuel Computer quantity verification check as mentioned above, a couple of other minor changes were made to the Before Start and Shutdown checklists. The revised Before Start checklist now assumes the Master Switch is already ON … otherwise, the pilot wouldn’t be able to read the checklist on the SkyView in the first place. As such, the opening of the fuel valve (and verification my added fuel pump switch is ON) was moved near the top of the list. I feel this is important for others using the checklists because the typical RV-12 has no fuel pump switch … so when the Master Switch is switched ON, the fuel pump comes on along with the SkyView. Having the fuel pump pumping with the fuel valve in the off position is NOT good for longevity of the electric Facet fuel pump … hence, the reason for checking the fuel valve is open is now the second item on the list. [Another side note: Typically, I leave the fuel pump switch ON all the time (unless planning on playing with the SkyView settings and menus for an extended period of time) so I open the fuel valve pretty much the first thing after rolling the airplane out of the hangar because it is easier to get a meaningful fuel sample from the gascolator during the preflight inspection with the fuel valve open … plus, when the Master Switch is flipped ON to power up the SkyView, the fuel pump won’t be loudly banging away from all the excess back pressure]. Another change made to the SkyView checklists was to the Shutdown checklist … which contained a couple of steps regarding securing the aircraft listed after the Master switch was turned off (kind of hard to read the SkyView checklist after powering off the unit). As such, those steps were removed from the shutdown checklist altogether because they are covered in the Pilot’s Operating Handbook, which should be in the aircraft. First impressions using the checklists with the SkyView: All and all I really do like Dynon’s implementation of the checklist feature. 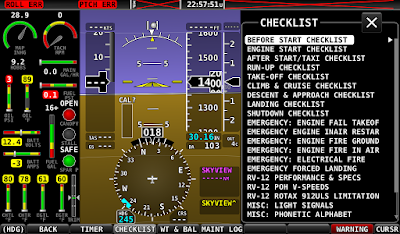 As mentioned in a previous post, to view the checklists, the pilot presses the Tools button from the main menu to access the Tools menu and then presses the Checklist button. This initially brings up the Checklist titles window which lists all the checklist titles entered during the checklist creation process. The pop-up checklist window has an X on the top right that is used to close the pop-up checklist window entirely. Upon selecting a checklist to view from the checklists titles window, the desired checklist will be displayed in the checklist window ... where in addition to the X in the top right of the window there is also a back arrow which navigates back to the checklist titles window. The DOG Aviation SkyView is optioned to display the navigation map on the far right frame on the SkyView display, so when the checklist window overlays the navigation map it pops up on the right … this leaves the Primary Flight Display and Engine Monitoring System screens visible as can be seen in the screen shot below. As can be seen in this screenshot, after pressing the Checklist button in the Tools menu the Checklist titles window pops up and overlays the map … displaying all the available checklist titles. The window will scroll if there are more titles than room to display them. Note the X in the upper right corner of the window … this will close the checklist window as will pressing the gray Checklist button. 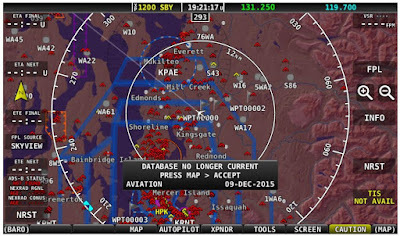 One welcomed feature of Dynon’s checklist implementation is when a checklist is being viewed, should the checklist window be closed to view the map or navigate to some other SkyView menu, when the pilot returns to the Tools menu to reopen the checklist, the last opened checklist will still be displayed. The screenshots in the below example demonstrate how the SkyView remembers the current checklist being viewed. As an example, one step I added to the Before Start Checklist is to verify that the Fuel Computer is actually set to the correct fuel amount ... since anything over 16 gallons is displayed as 16+ gallons on the fuel level indicator on the EMS screen. In the first screenshot below, one can see the Before Start checklist is open and I’ve highlighted the entry for EMS Fuel Quantity just to show the position within the Before Start checklist. 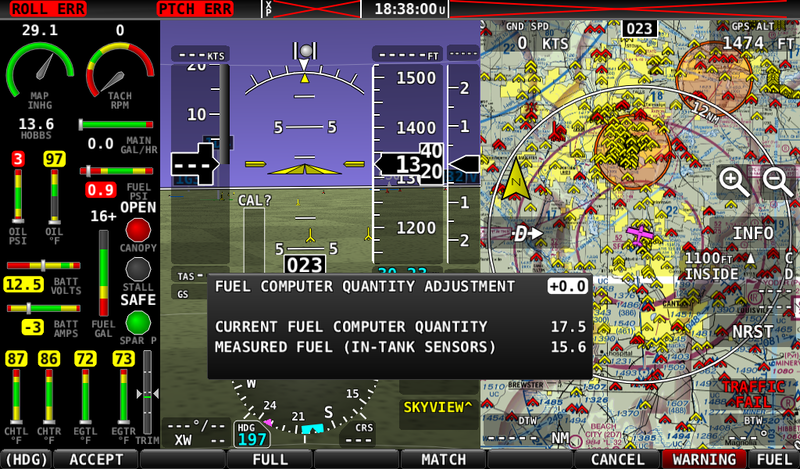 The second screenshot reflects closing the checklist window (the map is now visible) and opening the Fuel Computer window to verify the fuel quantity is actually set to 17.5 gallons. As mentioned earlier, note how the EMS fuel gauge shows the fuel level at 16+ gallons even though the Fuel Computer's quantity is set for 17.5 gallons. The third screenshot demonstrates that after closing the Fuel Computer window then returning to the Tools menu and pressing the Checklist button … the SkyView displays the last checklist that was in use which, in this example, was the Before Start checklist. Note the EMS Fuel Quantity entry is still highlighted which is how it was before leaving the checklist menu to look at the fuel computer. Screenshot of the Before Start checklist. Here I’ve highlighted EMS Fuel Quantity before closing the checklist menu altogether to demonstrate upon returning to the checklists, the pilot will be returned to the previously opened checklist and correct position within the checklist. Also note the return arrow in the upper left is used to navigate back to the checklist titles window if desired. 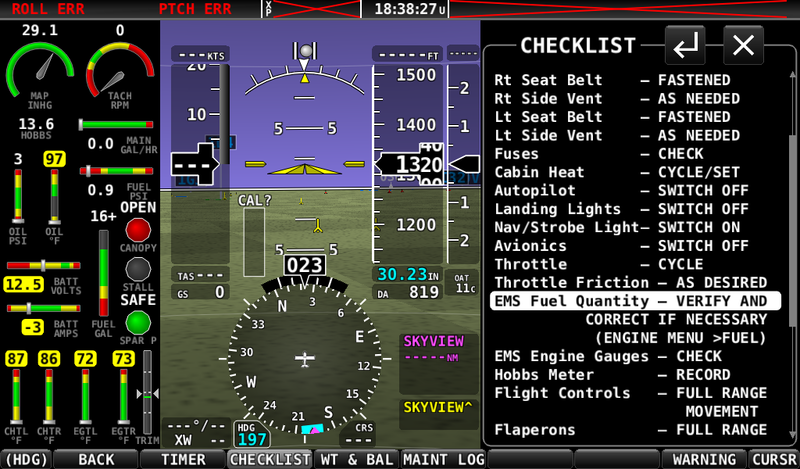 This screenshot was taken after checklist window was closed (one can see the map now) and the Fuel Computer window was entered to verify the fuel computer quantity. Note the fuel gauge on the EMS display shows 16+ gallons but the current fuel computer quantity shows 17.5 gallons … 17.5 gallons is the correct amount fuel onboard. Earlier, I adjusted the fuel computer after the SkyView initialized and brought up the fuel computer window shown earlier in this post with the mismatches highlighted in yellow. 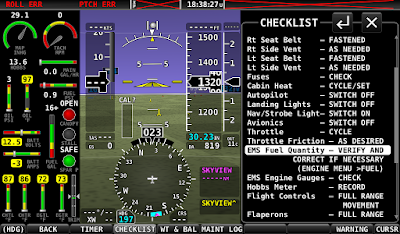 This screenshot was taken after closing the fuel computer window, returning to the Tools menu and pressing the Checklist button. Note the pilot is right back to looking at the Before Start checklist that was last viewed and at the same location within the checklist as evidenced by the EMS Fuel Quantity entry still being highlighted. As one can see from the above screenshots, closing the checklist window while displaying a checklist will not require navigating back through the checklist title menu to reopen the checklist. When returning to the checklist by pressing the Checklist button ... the checklist window will pop back up displaying the last checklist displayed at the time the window was closed along with the correct location within the checklist. I find this feature particularly useful to que a checklist in advance so when the checklist button is pressed, the desired checklist is already being displayed. Nice! 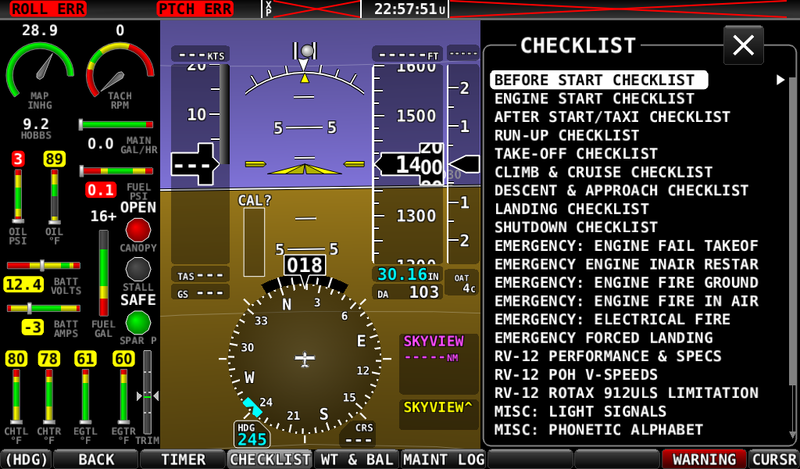 Also feel there may be somewhat of an added safety benefit to displaying the checklists on the SkyView. In my case, I was using a kneepad with rings on it that had laminated checklist cards attached. While reading the lists, my head would be looking down at my lap and nowhere near the outside … but while using the checklists displayed on the SkyView screen, I found myself unconsciously glancing up occasionally to look out the canopy. Must say I really do like the SkyView checklist feature a lot and would wholeheartedly suggest pilots who have not yet looked into this feature, seriously consider doing so. 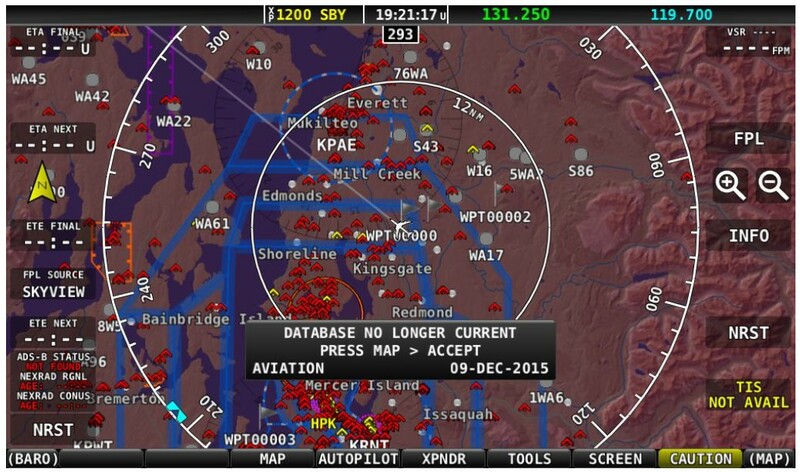 Dynon’s implementation of displaying checklists on the SkyView is truly an easy to use, pilot friendly feature … and being able to que a checklist in advance … well, that’s just icing on an already good looking cake.